National litigation consulting firm Litigation Insights is honored to be voted 2017’s “Best Jury/Trial Consultant Services” by the readers of Missouri Lawyers Weekly. 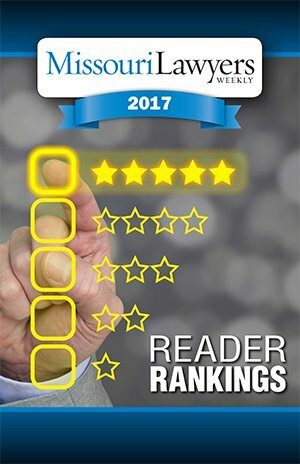 Litigation Insights is thrilled to have been selected #1 for Jury/Trial Consultant Services by the readers of Missouri Lawyers Weekly. On June 19, the award-winning periodical released its 2017 Reader Rankings to acknowledge the top firms who support Missouri lawyers in their work. Its many readers voted on a variety of categories, from Firm Management to Trial Services. Litigation Insights’ consultants utilize jury research techniques such as early case assessment, mock trials, jury selection, and witness preparation to help clients better connect with juries and judges through strong themes and case narratives. With a proven record of developing effective strategies for the most difficult cases, the company has garnered an extensive client list, including multiple Fortune 500 companies. Missouri Lawyers Weekly is an acclaimed resource for lawyers looking to keep a pulse on key legal news across Missouri. Its in-depth coverage tracks firm mergers and break-ups, lawyers in the news, and legal decisions from the Missouri state and federal courts, as well as rule changes, verdict and settlement reports, bar-discipline notices, and more. Litigation Insights is a national, woman-owned company with more than 20 years of experience conducting jury research, developing trial graphics, and assisting counsel with jury selection and courtroom support during trial proceedings. As a full-service consulting and visual communications firm, the company provides everything from mock trials, witness preparation, and jury selection to trial graphics and courtroom technology. Its offices are located in Kansas City, Minneapolis, and Dallas. Interested parties may call (888) 339 9885 or visit our website: http://litigationinsights.com for more information about the company.